“I have not a clue whether we humans will live for another 100 or 10,000 years. We can’t be sure. What matters to me is the fact we have fallen out of a very ancient love affair – a kind of dream tangle, with the earth itself. If, through our own mess, that relationship is about to end, then we need to scatter as much beauty around us as we possibly can, to send a voice, to attempt some kind of repair. I think of it as a kind of courting – a very old idea. This isn’t about statistical hysteria, it’s about personal style. Any other response is just not cool”. To start could you perhaps tell us a bit about your work for people who aren’t familiar with it? Storytellers are people who are always keen to know if you come from a storytelling tradition of one kind or another, and the wonderful truth about this revival of storytelling that we’re experiencing is that it’s in its infancy, and there are very, very few people that come from some unbroken tradition. In actual fact the art form which we all practise has many different heads. The poet Rumi says “there are many ways to kneel and kiss the ground”, and that’s what I like about this storytelling thing, there’s no particular way to do it. However, I do have a specific interest in it that is not broad, it’s quite specific. It’s really this notion of mythology as the heart of ecology, that among the statistics and the seemingly bad news of now, is actually tremendous opportunity, if you have the eyes to see it and you have the heart to follow it. I like the notion – this comes from the American writer Sean Cain, he says “myth is the power of a place speaking”. Myth is not just allegory, it is not just societal control, it’s not just to keep us in line, it is actually what I think of as a kind of echo location coming out of the ground designed to rub up against people whose ears are tuned enough to hear it. As the question arises of what stories do we need now, what are the – I don’t particularly like the term ‘narrative’ because it’s just got no salt in it – but what are the narratives of now, what are the stories of now, I think it’s a good question, but I don’t think we can co-opt, or cut-and paste particularly, things that have enough resonance in them to really sweep people up. 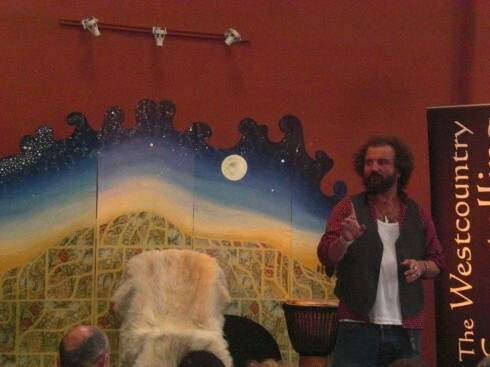 Martin in full flow at the 2012 West Country Storytelling Festival. Myth means ‘no author’. The reason why certain stories land so deeply within us is because they’ve been passed like water over dark stones through many different communities and many different people’s lives who’ve all dealt with seemingly hopeless causes. So the images have a resonance that one person alone cannot muster, no matter how brilliant. Over the last decade, I suppose I’ve been drawn to those kinds of stories, stories that seem to talk about a very real living relationship between the complexities of our life, wilderness, the natural world, and these big stories, what some people call ‘fairy tales’. My interest, as I now come to the end of another decade living in Devon where I grew up as a child, is specifically in local stories, and I am interested in the local stories of farmers and shepherds and people that have lived here, but also the stories that have been embedded in the place for a long time. How do new myths get created then? When does a story become a myth? Well, don’t set your watch any time soon! But don’t get depressed either, because what we can have is mythic stories. 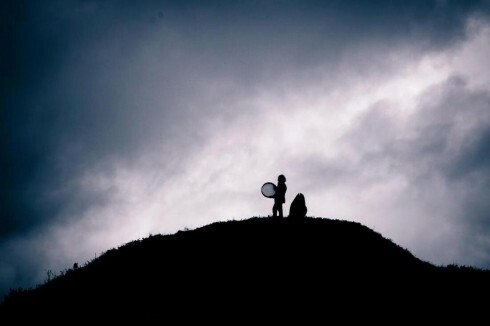 It doesn’t mean there’s no myth in them, but a myth is something that really comes from a kind of dreaming. When I think about what I know of Transition, I really like the amount of spirit and clarity in what’s happening. My background is in wilderness rites-of-passage. I’ve been taking folks up to Snowdonia in Wales where you go out onto the land and for four days and nights you fast. Now what tends to happen is, around the fourth day you’ve got through the issues with your mother, you’ve got past that relationship that went wrong, you’ve got past your societal and psychological stuff. Around the fourth day, you experience what tribal people tend to call “the wild land dreaming”, so you get dreamt by the land. The stories that folks come back with have a very different quality to them, than had they tried to think them up in their study in Croydon, or Ashburton. In other words, I don’t think we can suddenly produce a myth. I don’t think that the big problem of climate change or everything attached to it will come from one big answer. But the genius of myth is that its illuminations, its truths are polyphonic, they come from lots of different places, and I would suggest that we need to tune our ear. It’s an interesting thing. Big questions for me are around the European tradition of story, which is essentially Greek, Gaelic and Celtic, and the kind of images and understanding you get from Siberia for example, or the Iroquois, they’re bringing stories with them that are very different and, I think, have something to say. I’m very interested in the fact that in the last 20 years as you’re well aware, the migration patterns of animals have radically changed. The migration patterns of stories have also radically changed, so you can go to a pub in Plymouth now and see a guy that’s never left the West Country tell you a Seneca Indian story and that’s really remarkable. What does that mean? You go over to Canada and certain animals, certain birds are wintering 200 miles further north than they used to, and they’re having to deal with what I would call their myth-line orientating to a new situation, a new nest, a new season, when when do I give birth, all of that. I think, the migrational patterns of stories and the migrational patterns of animals, are telling us something about the malaise we’re in. They’re telling us something about what we’re in now. This is a very long answer to your question, but it’s those sorts of areas I think are going to give us the stories with the kind of soul-food we need. The stories we have now culturally are completely inappropriate stories, those that we get through the media and so on, so what you’re suggesting is that rather than sit down and create our own and write the stories for now, it’s more that we need to connect with the wisdom we have in our myths. It’s about choosing the most appropriate myths? 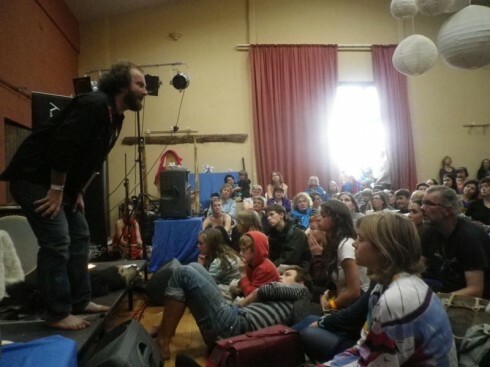 Whether you are religious or spiritual or story-orientated or not, we’re all worshipping something. Every day we get up and we go to some kind of temple or another. My question would be, to something like Transition, what temple are you entering every day when you go to work? What stands behind what you do? For some people that’s a temple with a lot of money in it, for others it’s different again. So I would say the stories we’re being fed now are not myths, they’re what I would call toxic mimics. They’re not myths. But when we’re deprived of the real thing, we will take even an echo of that and grab on to it. In other words the most horrible lies always have a little bit of truth in them, just enough. It’s not an easy task. I would suggest folk spent more time investigating the stories and the people they loved when they were children. I’ve been thinking about this recently. I don’t know how old you are but I’m at the very beginning of my mid-life, and I recognise more and more that the kind of man I want to be is the kind of person I loved when I was a very small child. The old (not that I’m going to be an old woman) the woman who turns up at the party with lots of chocolate in her pockets and gold coins and is gambling and the old man that starts an outrageous fight with an uncle. That’s the kind of thing I like! But I would say a place to begin, in all of this rambling, a place to begin is as simple as an apprenticeship to a 20 mile radius of where you live. In other words to say I am going to limit my boundaries. We’re in a very rich area here, we’ve got the songs of the Brixham fishermen as they go out in the morning, we’ve got all the folklore attached to Dartmoor. The Aboriginal idea is of a songline going over a land, and you go to this tor and this river and you know the story of that place. My challenge is, both to myself and to other people, to build up a web of your own myth-lines about a place. Also not to be snobby, so I’m not saying this has to be of the natural environment, William Blake found a lot of this in East London. He’d gaze under a bush and he’d find Ezekiel when he was 8! So this is something that can be found anywhere. As you know, we don’t have a lot of wilderness in England, but we do have a lot of wildness. You only have to go between two derelict buildings and see a little sliver of weeds and it’s – BINGO! Don’t be sizeist, that’s where you can make your apprenticeship. … around us, and you mentioned Gary Snyder saying everyone can be “famous for five miles”. How would that work in practice? How would someone start to embody that in their daily life? There’s actually an old Gaelic word, the old Gaelic word for this kind of cultural custodian, cultural historian is called a seannachai, and they were a particular kind of storyteller, and I think we need a re-visioning of this particular character, and I’ll explain why. They were somebody that was thoroughly drenched in a place. They had their personal relationship to it, they knew the great dreaming myths of the place, but they also knew about the agricultural patterns. They knew about the hedgerows, they knew about particular flowers, they knew about remedies, and they gathered it all together in an extremely unpretentious manner and they just embodied something, they walked something whether they knew it or not. I like the idea that rather than getting het up about whether people are story-tellers or not, we should work with the notion of the story-carrier. The story–carrier again is a tribal idea that whoever you are, from whatever disposition, you’re carrying the walk of your own life. You may not like it, you may need to change the story, but I’m interested in a culture of story-carriers, and that means a certain amount of self-esteem. It means you can’t be so caught up in European self-loathing that you think your story’s not worth telling. So I like the Snyder thing that “famous for 5 miles” means that no matter how green you think you are, you still carry what I would call an interior king or queen within you. Over the summer I’ve been to various events with a lot of anarchist groups and a lot of road protesters, many of whom I admire, but I have to say look, with the best will in the world, it’s only when your interior king or queen has died that you start giving over that kind of power to the kind of idiots we see in government at this point. In actual fact you want to reclaim some of your grandeur, reclaim the belief, call certain parts of yourself out of exile. Many stories end in a wedding, they end in a wedding for one reason, the storyteller is saying to you, call to the wedding the parts of you that have got edited and cut away as you age, bring it all back to the feast. I like that kind of language. I’m a language person, I’m an apprentice wordsmith, and so one of the things that interests me with the concerns we have at the moment, with Transition and others, what interests me is handling of language. That it is imaginative, that it is lively, that it has nuance and depth to it. Now that’s difficult when you’re trying to get across to a lot of people, I am very aware of that, but I think it can be done. We live surrounded by the stories of place in the walls and the hills and the trees and the place-names and so on, but we also need to make changes to these places where we live so that we can actually move forward from here, some of which might be seen as being challenging. How do new and old stories sit alongside each other in a culture that needs to reinvent itself quite fundamentally? Paradoxically. That’s how they do it. Paradoxically. The God of the storytellers is a character called Hermes. If you are in touch with Hermes, Hermes has something called the third ear in a conversation. As soon as things polarise, as soon as it’s one way or this way, you’ve lost Hermes, he’s not there. What I feel very strongly about, as soon as I feel that polarisation happening, I’m anxious, because the thing that stands underneath, the Roman name for Hermes is Mercury so if you have a mercurial conversation it means it has energy in it, it’s exciting, there’s possibilities and ideas. Every time that happens a god is in the room, so there’s going to be paradox. I think mythological thinking is not from the past. I think it’s already in the future and we’re moving, re-moving towards it through the last hundred years of psychology actually. It’s going to be ugly at times, there’s going to be losses on some sides and gains on the other, but I wouldn’t want to live in any other time but this. I think it’s fantastic. I do, I think it’s fantastic. But we have to be tuned to paradox. We have to be rather like the French word, a bricoleur, the old artist that walks along and says “here’s something from here. Here’s something from here. Hmmm, they may not fit together but I’m going to try it in the hope that what I do is so beautiful that the sun rises in the morning and the moon comes out at night”. That’s what the old gypsies believe, they say that if your life doesn’t carry enough beauty with it, the sun won’t come up. Now that is a new definition of self-esteem (laughs)! I like that very much, it’s good for our kids, and that’s what I feel so strongly. You’ll be very familiar with the native notion of the next seven generations, what are we doing now. Something I’ve been aware of with this Transition thing is this idea of what will be said about us now. I like that, that is sufficiently stirring. Your sense is that that process, from its fiery bit through to its deeper bit, should be accompanied by a storyteller who is able to input the most appropriate myths at the most appropriate time? I wouldn’t want to place too much importance on the storyteller’s shoulders because I think a lot of the story will really come out of the community, it will come out of the people. I dare say that a lot of what is binding this together is this sense of a really great common goal. In other words, it’s not so much someone coming in didactically and saying this is what it means, but I would suggest that people take that task on. There are people designed to be pragmatic and strategic and there are other people designed to dream, to ponder, to walk and to be a bit obscure. Every Arthur needs a Merlin. Every movement needs a dreamer, it needs a Merlin, it needs someone getting dreamt. All traditional cultures combine what you could call the wisdom of the village and the knowledge of the forest, and all rites-of-passage are about taking what’s best of the village, going out into the wild, getting loosened up by nature and bringing back that visionary content to the village. 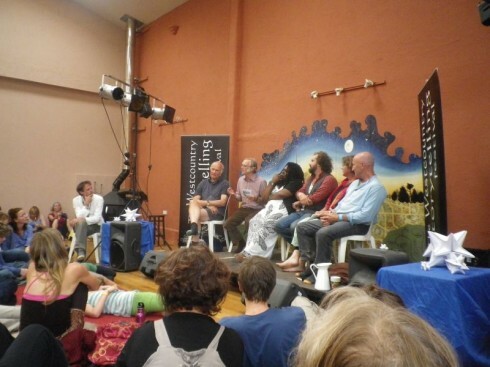 Martin, third from the right, part of a panel discussing ‘Sustainability and storytelling’ at the 2012 West Country Storytelling Festival. The reason why, in my humble opinion, we’re in the state that we’re in now, is because of an absolute amnesia about this ancient process. What happens is when you deny the wild, you get the feral, you get the savage. I’ve probably said I was watching the riots last year and my heart was breaking because I was looking at all these young men and women perfectly tuned for initiation turning savage instead of wild. It’s the mosh pit, not the flamenco dance. I’d like to formally invite 17,000 Eastenders to come up with me to Snowdonia next year and go out on the mountain. I think it would be great, why not?! Joanna Macy who talks a lot about this, she says that the Agricultural Revolution took thousands of years and the Industrial Revolution took hundreds of years, but what we need to do now needs to take 10 years, 15 years, and if we do pull it off people will tell stories and sing songs about it. In a sense, if we manage to get it right over that period, it’s not for us, it’s for the people that come after us to tell the stories about what we did, rather than for us to tell the stories about it now? Yes, because we’re in the experience. All storytelling is a reflection on something, it doesn’t happen in the moment. So our stories need to settle in 100 miles of dark soil before they flower, and any premature flowering will not be convincing. To use an old fashioned word, the soul is not convinced by much. You really have to do something dramatic for it to pay attention which is why normally it takes a car-accident or an illness or a divorce, something to rock everything we have around us for the soul to go “oh, something could be happening here”. Now a lot of my work is, how do I stay in conversation with the soul without setting fire to my own life, how do I do that? I think the challenges we have right now and the opportunities we have are a perfect opportunity to do that. A lot of opportunity is going to arrive in the next 20 years disguised as loss. You mentioned about the role of young people. The work that you do, you’ve worked in prisons and with young men quite a lot, what’s your sense of what the need is there, and the power of what you can bring to that. How have you seen the power of that? Where are we going wrong with our young people? That’s enormous! You and I were both at that conversation about story and sustainability (at the West Country Storytelling Festival), and it immediately polarised between this notion that we have young people in Deptford divorced from all feelings of the wild, and any ownership of it, no story, and this kind of tree-hugging place we all live in down here where everything’s fine. You and I both know that that is a false distinction, because you only have to wander out into the back streets of Totnes or Newton Abbot or Torquay to see a mass disassociation. It’s not as if the West Country is a cure-all for anything. But what I’ve been doing for the last couple of decades is simply taking people who are within a nanosecond of a jail-sentence, being pulled back, taken out into a wild place, to present them with something that is infinitely wilder, and more unruly than anything they could have been prepared for. That’s the thing. A lot of people ask me about this weird thing what is an elder? It’s an old fashioned word in Totnes, it’s been used a lot, but I’m interested in it. The notion of an elder is someone who, when faced with an opportunity for self-advancement doesn’t immediately take it but looks around and says “how does this affect everybody else?” I’m a bit slow to that one. But that’s what I’m aspiring to, that wider thing. Secondly, I meet a lot of people that say, “well I’m too damaged for that kind of work because I didn’t get that, how can I give what I haven’t got?” Second response is, “if you haven’t been fed, become bread”. There just comes a point when it’s not appropriate any more in the business of being an adult to talk about what happened when you were three. You’ve got to become bread. Thirdly, finally, the elder, in my opinion and my experience, is somebody that has taken the tangled walk of their life and can see an evident story within it and knows how to tell it, and when they tell it, they tell it without lies. In other words it’s not self-aggrandising particularly, it’s not what you’d put on your CV. But it carries. How do you take failure and turn it into an elegant expression of beauty? How do you do that? All these stories that we really love are filled with complexity and failure. They’re very rarely a quick ascension. If it’s a quick ascension it’s not a terribly interesting story. We are in a really interesting story. At the Storytelling Festival, without ever making it overt, the stories that I brought were specifically stories that I think are about right now, specifically, and I would love to tell them within that context, within the context of people asking those questions about now. Normally I’ll tell a story and then I’ll spend an evening or a day or two days going into its deeper implications, and when you start to look at the deeper implications of these stories, one of which has a serpent wrapped four times around the world squeezing the oil out of it, I mean, my God, what more do you want? This is 2,000 years old, it’s perfect! The business of story is that it’s telling us about a malaise of us inside as well as the malaise of what’s going on outside. Now that might be unfashionable, it might sound like hippy jargon, but if this stuff is really going to take fire there has to be that, the inner and the outer. I suppose what I’m looking for is people with a little bit of credibility to present those ideas, so you trust them. I think what is going wrong with young folk or what they don’t have, they’re trying to be initiated by siblings, and that’s never happened in any culture before. In other words, all of their self-esteem, all of their information, everything that they build around them is coming from the horizontal, it’s coming from their age group. It’s never worked like that before: they may have loathed their parents, they may have loathed their uncles and their aunts, but there was a sense of a multi-generationed experience of living. Out of that multi-generationed experience of living, you saw people die for example, and when you see people die it means hopefully you won’t walk backwards into your own death, so you learn to die a little bit every day. I don’t mean that in a dramatic way, but I think that’s part of what it is. Now, with the amplification of the teenager, which we know is a more recent invention, they are more disassociated and more disappointed than ever. In the old Celtic tradition, they said if you want to do anything interesting with your life you need to be wrapped in what they called the swan feather cloak of story, and you need to have a real relationship to the land around you. If you don’t have those two things, it is as if your skin is too sensitive to deal with the inevitable disappointments that will come towards you, you need some kind of cloak, you need some kind of protection, and story and connection to the outside world has provided that. Because we don’t have that, I think this malaise is going on, not just with young people but all over the shop. I remember one of the things that really stuck with me…was about young men who wherever they’re from, boss the place, in the woods on their own for the night, that actually they find it far scarier than anything else. You have no idea! I’ve seen it again and again. I’ve physically broken into crack dens and grabbed kids who’ve agreed to do this, stuck them over my shoulder, fought my way out, thrown them in the car and driven to Wales. And I have witnesses. Because they want to do it, and when it gets near to the knuckle they don’t, and I’ve seen guys like at who have ‘love/hate’ on the knuckles whimper as the indigo-black settles around them and you say, “for the next four days you are miles and miles and miles away from anybody”. At night you don’t have a fire. You don’t even have a tent, just a bit of tarp, so you’re utterly open. But in that darkness occasionally there will be the movement of a deer or a fox or a badger, and that is edgy. The reason why initiation has traditionally been so successful is it takes frankly young people who think they know everything into a position where they go, “I think I know quite a little”. And they pay far more attention to older folk that have been through that experience when they get back. And they get praise, they get blessing. We’re not a praise culture any more, we’re a sort of sugary, horrible, affirming, ghastly thing. Up until 100 years ago in Russia for example, the toast you would get at a meal where someone says, I am toasting you because I saw you do this thing and at this time. It’s a quote I use a lot but I have a friend from the Deep South who says, “if you know a young woman or man and you care for them and they take you seriously, if you haven’t praised them in the last two weeks then you are hurting them. You’re hurting them”. That’s enough for me, I can just take that one statement and do that for ten years, that’s enough. I think those things are utterly connected to Transition and connected to the wider ecological questions of now. I’m going to take that, Rob! Thank you very much, that’s a good idea! Someone once said to me, how important is it for you to be right in a domestic with someone you really love? How important is it? Choose your battles. So yeah, I learnt from that (laughs). Lastly, with Transition there are people in thousands of communities now around the world who are trying to gently nudge the place they live through creating stories I suppose in terms of the projects they’re doing and sharing those stories, and certainly at Transition Network a lot of my job is telling the stories of what they’re doing in Brixton or what they’re doing in Dunbar in Scotland, what they’re doing in Totnes. The story that’s unfolding here in Totnes is absolutely fascinating and resonates around the world, which is why so many people come to see it. That sort of story, documenting story and communicating story is a big part of what Transition groups do. What would be your final thoughts or advice for them on how to do that deeper, richer, better? I’m very bad at answering direct questions because the way I was taught – I was taught really through tribal people who do answer questions but it’s very circuitous. (Pauses) When the Normans invaded Britain … (laughs) … they really, really torched this country (this isn’t building up to a rant about the French or anything like that!) when they did this, what happened was nobles in rich feudal families disappeared into the woods, they fled. Not only did they flee, a lot of the folks who had worked for them and actually had a very warm relationships, as what we call peasants, also fled into the forest, they just disappeared overnight, a generation of Britons fled to the forest. Now, the Normans gave them a name, they called them the Sylvaticae (‘People of the Forest’). During that period of devastation, Britain came under what they call the ‘Norman Yoke’, and they said we are never going to get rid of these people, they’re too emphatic in their destruction. But what happens is, over about 150 years of this strange forest thing going on where dignitaries are befriending and forming families with local people back and forth, you get what we now call ‘The Greenwood Spirit’, because out of that come the Robin Hood ballads and Hereward the Wake, this very affirming culture of resistance that grew up in Old Albion, it grew up in Britain. I get a huge goose-bump sort of excitement when I hear about the Sylvaticae, so what I would offer to Transition is a sort of Sylvaticae programme where someone, a storyteller, travelled from community to community and heard and witnessed the stories, in fact maybe just wrote them down in some enormous leather-bound book. In King Arthur’s time you couldn’t have a feast without an adventure occurring, you could not eat until something had kicked off. Bring that back! Then the whole thing gets this swagger. I’m really interested in words like panache and swagger at the moment, because that’s something traditionally that us on the left, we lack a bit. If we brought that back, I would say, an appreciation of the local, a recognition that it has this mythic undercurrent to it, a collecting of those stories – I’m sure you’re already engaged in books and things like that about it. But I like this notion that underneath Britain, underneath the concrete and underneath the towns, there is this old, ancient, dreaming spirit that is just waiting for people to live in the right way, and when you do it, you have a kind of genius underneath you that you as a person don’t just possess, it’s something greater than that, some divine wind comes. All I know is if this happens and folks live with this, not only will they feel nourished, not only will their experience of living be stronger, there’s something coming from the ground itself. I know that sounds very esoteric, but I stand by it. You can find out more about upcoming events being run by Martin here. After a really wild and stormy night, I presume it was your group, Martin, that came down from the mountain. Before you crossed the river on your way out we stood and sang our passionate gypsy song to you all. We drank deeply from your wildness in a powerful magical moment of wordless deep connection. We certainly felt we were being ‘dreamt by the land’ in moment. Yes Martin Shaw is a fantastic man and his work gets to the core of the converging crises we’re facing. Paul Kingsnorth and Dark Mountain are running a wild writing weekend with him at the end of November, I’m not sure if there are any tickets left but I’d strongly recommend it. Failing that, I’d do any course with him. Thanks for the interview Rob. I’ve been conscious for a long time that the work of CG Jung has dropped out of sight. This is surely symptomatic? I recognise resonances throughout this terrific interview between Martin’s and Jung’s inner worlds. I do not think you can be an elder if you haven’t come to terms in one way or another with your own myth, and especially the weakness and faults in it, and most of our current media resists this healing work. The importance for Transition? The key is in Martin’s insight: ‘opportunity disguised as loss’. Stalled Transition initiatives need four nights in the woods. Its absolutely real, what is happening to the world; we need help and must ask for it. Interesting about the soul noticing something happening only because its an extreme life event. I work as a clairvoyant, (amongst other things) and my take on the soul is that it knows and has chosen the path we take on each life, it’s only the personality that has forgotten the twists and turns of its journey.